In addition to allowing just 9 runs in the series, the Yankees pitching staff held the Red Sox to just 22 hits in 36 innings, while racking up 43 strikeouts. The Yankees hammered Chris Sale in the final game of the series, forcing him to throw 109 pitches to make it through just 4.1 IP. 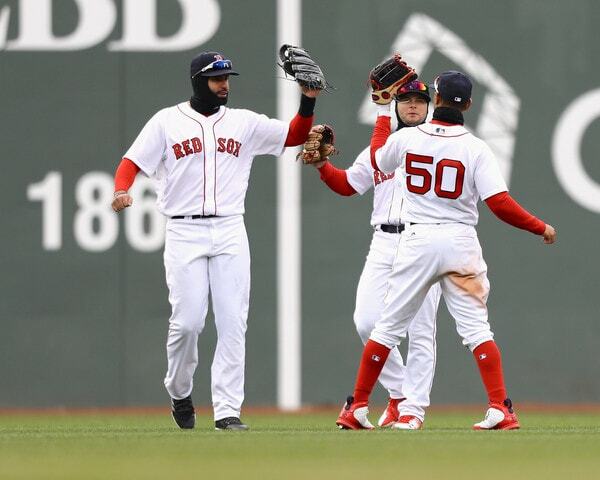 They scored three runs (all on solo home runs), and had a total of nine base-runners reach against the Red Sox ace. All three home runs came from now ex-Yankees, in Chase Headley, Todd Frazier, and Matt Holliday. Check out Katie’s Yankeemetrics post for more information on the series. Xander Bogaerts was placed on the disabled list yesterday, having suffered a fracture in his left ankle on Sunday afternoon. He’s not expected to be out for too long, and could be back by the end of this month. Other notable names on the DL include Dustin Pedroia, Drew Pomeranz, and Tyler Thornburg, none of whom are expected to be back for this series. The Red Sox are tied with the Mets (insert small sample size and/or deprecating joke here) for the best record in baseball at 8-1. That record represents their best nine-game start to a season in franchise history, It’s all about pitching for them, as they’ve allowed a scant 26 runs in those games – and seven of those came on Sunday. Well, pitching and a certain amount of luck, as they’ve already played four one-run games, and came out victorious each time. And it’s also worth noting that they’ve played seven games against the Rays and two against the Marlins. Heading into 2017, FanGraphs pegged the Red Sox as a 93-69 team, FiveThirtyEight went with 91-71, and PECOTA brought up the rear with an 88-74 mark. An argument can be made that Sale was the best pitcher in the American League last year. He led the junior circuit in innings pitched, strikeouts, FIP, K/9, K-BB%, and FanGraphs WAR and, were it not for his mortal numbers down the stretch (4.09 ERA from August 1 forward) he probably would’ve won the Cy Young. 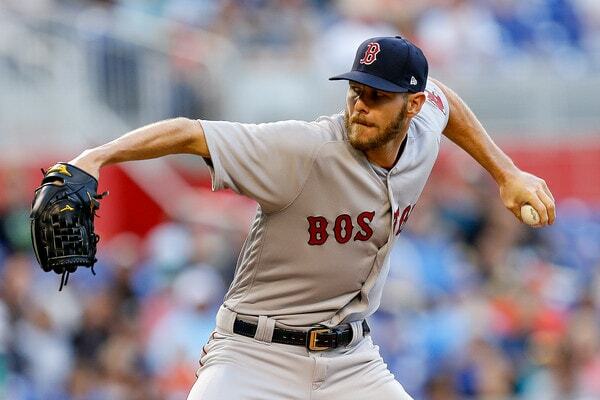 Sale’s back to dominant through two starts this year, though, with the following line thus far: 11 IP, 6 H, 1 ER, 3 BB, 15 K.
Sale is a four-pitch guy, with a mid-90s fastball, a low-90s sinker, a mid-80s change-up, and a low-80s slider that shouldn’t be allowed because it appears to defy the laws of physics. Price has struggled with inconsistency and injury in his two-plus seasons with the Red Sox, but all of the talent is still there. He’ll be 33 in August, so there might be some room for concern that he is on the decline – but he looked great coming out of the bullpen after returning from the DL last year (15.1 IP, 8 H, 0 R, 4 BB, 19 K, including the playoffs), and he’s been just as good through two starts this year. I think we all know what Price is about, given that this will be his 38th start against the Yankees. On the off-chance you don’t, he throws a low-to-mid 90s four-seamer, a low-to-mid 90s sinker, a high-80s cutter, a mid-80s change-up, and the occasional curveball in the upper-70s. This is somehow already Porcello’s tenth season in the majors, and he will be 29 for the entirety of the season; I suppose that’s what happens when a player comes up for good a few months after his 20th birthday. Porcello has basically been the portrait of a league-average starter throughout his career, with his excellent 2016 (223.0 IP, 142 ERA+) being the outlier among 8 seasons with ERA+ marks between 85 and 114. He has looked quite good through two starts this season, with a 2.84 ERA in 12.2 IP. Porcello is a true five-pitch pitcher, with a low-90s four-seamer, a low-90s sinker, a mid-80s slider, a low-80s change-up, and a mid-70s curve. His sinker usually accounts for between forty and fifty percent of his offerings in a given game. The team’s great pitching has predominantly come from the three starters the Yankees will see this week, as the bullpen has pitched to a 4.24 ERA in 34.0 IP. They’ve issued 20 free passes in those innings, as well, which could prove to be incredibly advantageous for the Yankees lineup. Closer Craig Kimbrel has walked four in 5 IP but has yet to surrender a run, and set-up man Heath Hembree has been light’s out. Carson Smith (4 ER in 3.2 IP) and Joe Kelly (4 ER in 3.1 IP) were expected to fill the fireman role for the Red Sox this year, but both have struggled so far. It’s Eduardo Nunez, and that’s pretty much it. And, in case you need a reminder, he hit .267/.313/.379 (88 OPS+) with the Yankees, and .289/.322/.435 (103 OPS+) with everyone else. That’s not a great shock, considering he was entering his age-27 season when he was dealt to Minnesota, and it’s heavily BABIP-driven – but it’s still mildly annoying.